My wife and I were discussing responsibility to family because she was having difficulty reconciling 2 passages of Scripture. While travelling to Jerusalem, Jesus speaks to some of the crowd travelling with him. So if we are to leave family for the sake of the kingdom, how does that fit in with Paul's statements about family responsibility? Looking at Jesus' words it seems that leaving family members could theoretically be asked of us (not that it necessarily is). Note, however, that the comment about leaving houses etc. is in the context of the rich young ruler who does not want to give up wealth for the sake of the kingdom. So this is more a comment by Jesus on the importance of choosing the kingdom over anything else, even very important things such as houses and family. Jesus follows this with a promise that God will give us more than we give up. And this may be part of what Jesus is saying in the Luke 9 passage. Parents and family are having a hold on someone who Jesus wants to join the kingdom. Compare with Paul's comments which do not relate to a competing call for believers. Rather they are to discharge the call of the kingdom by caring for those to whom they have responsibility for. My conclusion in our discussion was that we are to care for those whom God has given us responsibility for, but we do not necessarily need to respond to those who would put their own claim on our lives. We are responsible to look after our children. God may also give us other children to be responsible for. God may call us to give our children to others to look after so that we may do a task for him—we are still caring for them appropriately as we are delegating our responsibility for that child to another at God's request (one should be absolutely certain they are hearing correctly from God in such a situation!*). But an adult does not need to acquiesce to a demand from family to live or act according to their agenda. A request to remain part of the family business, or not to leave until one's parents have died may not be legitimate. If at some future time one's parents become infirm, the child may now have the responsibility for them placed on him by God and he needs to discharge that responsibility appropriately. *This comment needs its own post to explain more fully, I don't mean to suggest that this is a common request from God. There is an ocean pattern in the Pacific called the Pacific Decadal Oscillation. It has a warm mode and and cool mode and switches between these every 20–30 years or so. It has switched to the early stages of its cool mode this year. Cool modes seem to be predictive of cooler weather over their duration. This combined with the current nadir of sunspots and no sign of the next sunspot cycle beginning, also a harbinger of cooler weather, means we could be in for a cold next few years. The Grand Theory of Evolution is clearly wrong as seen by comparing it to scientific findings that haven't been sieved thru an evolutionary filter prior to interpretation. But further evidence of its falsity and its implicit attack of Christianity can be seen by assessing its fruit. A recent example of evil disguised as science via evolutionary theorising can be seen in Helen Fisher's work. But in country after country, and decade after decade, divorces tended to peak (the divorce mode) during and around the fourth year of marriage. There were variations, of course. Americans tended to divorce between the second and third year of marriage, for example. Interestingly, this corresponds with the normal duration of intense, early stage, romantic love — often about 18 months to 3 years. Indeed, in a 2007 Harris poll, 47% of American respondents said they would depart an unhappy marriage when the romance wore off, unless they had conceived a child. Nevertheless, there was no denying it: Among these hundreds of millions of people from vastly different cultures, three patterns kept emerging. Divorces regularly peaked during and around the fourth year after wedding. Divorces peaked among couples in their late twenties. And the more children a couple had, the less likely they were to divorce: some 39% of worldwide divorces occurred among couples with no dependent children; 26% occurred among those with one child; 19% occurred among couples with two children; and 7% of divorces occurred among couples with three young. She starts with some basic data gathering, all very reasonable. I do note that there are variations and there is no indication that data has been assessed over a long time period, say 2000–3000 years. Then suddenly I got that "ah-ha" moment: Women in hunting and gathering societies breastfeed around the clock, eat a low-fat diet and get a lot of exercise — habits that tend to inhibit ovulation. As a result, they regularly space their children about four years apart. Thus, the modern duration of many marriages—about four years—conforms to the traditional period of human birth spacing, four years. Perhaps human parental bonds originally evolved to last only long enough to raise a single child through infancy, about four years, unless a second infant was conceived. Aside from mere assertion, lack of any rigour, or any actual scientific explanation—i.e. another evolutionary just-so story—this is justifying sin. Apparently we don't divorce because we are fallen, sin-choosing creatures. No, we evolved this way. It is in our genetic make-up. Our desire to divorce has no moral implications, it is the expected response to our physiology. By age five, a youngster could be reared by mother and a host of relatives. Equally important, both parents could choose a new partner and bear more varied young. And thus a conceived child-rearing methodology will be promoted as a valid alternative to the father and mother ideal. My new theory fit nicely with data on other species. Despite the fact that we are distinct from the animals which do not bear the imago dei. Scientifically, evolution is a fraud. There is enough reason to reject it based on its falsity alone. But I think many Christians fail to realise how much of an attack on Christianity evolution is, and how intrinsically evil is this extremely prevalent lie. Let's put it this way. Human lives are so short from God's perspective that He seldom has any desire to artificially shorten them. Previously I documented the endings of the New Testament letters. It is interesting to see common themes with Paul's letters. Paul writes 13 letters. 9 to churches, Romans thru 2 Thessalonians; and 4 to individuals, 1 Timothy thru Philemon. Of the letters, 8 contain a greeting from the companions of Paul (exceptions are Galatians, Ephesians, 1 Thessalonians, 2 Thessalonians and 1 Timothy) and all contain the comment for grace to be with the recipients. Of the 9 non-Pauline letters, the only ones to include a greeting from the companions are Hebrews, 1 Peter, 3 John. The only ones asking for grace to be upon the recipients are Hebrews and Revelation. I am not too certain how much can be read into the greetings. It may have been a common farewell in ancient letters. The fellow greetings are absence from the earlier letters of Paul and the recipients may not have known the people Paul was staying with. But the grace comments are intriguing. Here is the list in biblical order. The grace of our Lord Jesus Christ be with your spirit, brothers. This is a consistent feature with Paul. It suggests that grace was central to his concern for fellow Christians. It may also have implications on the authorship of Hebrews. This is similar to the other letters of Paul and unlike all the other letters in the New Testament save Revelation. While there are several arguments as to who authored Hebrews, this is one in the camp of Pauline authorship. Another interesting issue is that Paul personally wrote on his letters so his handwriting would be seen as a mark of authenticity. Paul's letters were written by an amanuensis (secretary). Paul specifically mentions his own handwriting in 1 Corinthians, Galatians, Colossians, 2 Thessalonians, and Philemon. It would be interesting to see if this comment were useful in dating Paul's letters, the presumption that it would more likely occur in the earlier letters. Philemon being an exception because here Paul is offering financial security. I was interested in the way the New Testament letters were ended by their authors. There are 27 books in the New Testament and 21 of these are letters, 5 are historical books and 1 is apocalyptic, though it also contains letters. Following is a list of the letters (Revelation included), author and last few verses. Finally, brothers, rejoice. Aim for restoration, comfort one another, agree with one another, live in peace; and the God of love and peace will be with you. Greet one another with a holy kiss. All the saints greet you. Peace be to the brothers, and love with faith, from God the Father and the Lord Jesus Christ. Grace be with all who love our Lord Jesus Christ with love incorruptible. Aristarchus my fellow prisoner greets you, and Mark the cousin of Barnabas (concerning whom you have received instructions—if he comes to you, welcome him), and Jesus who is called Justus. These are the only men of the circumcision among my fellow workers for the kingdom of God, and they have been a comfort to me. Epaphras, who is one of you, a servant of Christ Jesus, greets you, always struggling on your behalf in his prayers, that you may stand mature and fully assured in all the will of God. For I bear him witness that he has worked hard for you and for those in Laodicea and in Hierapolis. Luke the beloved physician greets you, as does Demas. Give my greetings to the brothers at Laodicea, and to Nympha and the church in her house. And when this letter has been read among you, have it also read in the church of the Laodiceans; and see that you also read the letter from Laodicea. And say to Archippus, "See that you fulfill the ministry that you have received in the Lord." O Timothy, guard the deposit entrusted to you. Avoid the irreverent babble and contradictions of what is falsely called "knowledge," for by professing it some have swerved from the faith. Peace be to you. The friends greet you. Greet the friends, every one of them. Are we about to enter a cycle of global cooling? Late last month, some leading climatologists and meteorologists met in New York at the Energy Business Watch Climate and Hurricane Forum. The theme of the forum strongly suggested that a period of global cooling is about emerge, though possible concerns for a political backlash kept it from being spelled out. However, the message was loud and clear, a cyclical global warming trend may be coming to an end for a variety of reasons, and a new cooling cycle could impact the energy markets in a big way. Interesting ideas. I for one would like a warmer earth, but a delay long enough to disprove the global warming alarmists, fear-mongers and propagandists will be a good thing. I am not even certain the earth is getting particularly warmer even though I perceive the benefits. But sun watchers have noted that we are nearing the end of a sunspot cycle and the next one seems to be delayed. This would cause a cooler climate. Speakers mentioned the sun's impact, the lack of impact of CO2 on global climate and the fact that man-made CO2 is pitiful compared to natural production. He has written a book on this last one. In a recent commentary Prager talks about why he thinks so many (Western) women are depressed. Societies and parents also always knew that it was imperative to teach girls to control their natures – in particular their predilection to be ruled by their emotions. Women who allowed their emotions to rule them not only became destructive (to members of their families first and foremost), they became unhappy women. However, with the advent of contemporary feminism and other social trends that coincided with the rise of feminism – among them the elevation of compassion over standards, the great emphasis placed on feelings, the rejection of patriarchy and the devaluation of traditional masculine virtues (like subdued emotional expression) – female nature came to be seen as far less in need of discipline than male nature. So, while society continued to teach boys to control themselves, it stopped teaching girls to do so. Girls' emotions and feelings were inherently valuable. And denying this was attacked as sexist, if not misogynistic. Consequently, the women many of these girls grew into lacked the ability to control their natures, to control their emotions or their moods, and therefore lacked the facility to engage in the self-control necessary for happiness and the avoidance of depression. I don't know if this is true but it seems somewhat reasonable on the face of it. I know that males (in general) deal more with aggression and that control of this aggression is important, though focusing it to do good is legitimate. It seems that focusing is now frowned upon and it should be suppressed rather than controlled. I do not think society sees an uncontrolled emotional disposition as a vice (which it is). Rather that emotions are and the expectation that other people submit emotion to the will is now the vice. As I wrote in my book on happiness ("Happiness Is a Serious Problem," HarperCollins), much unhappiness comes from having expectations. When our expectations are not fulfilled – and most are not – we can become unhappy and even bitter. And when our expectations are fulfilled, we are no happier because fulfilled expectations undermine gratitude (we are not grateful when we get what assume we will get), and gratitude is indispensable to happiness. Feminism raised women's expectations beyond what life can deliver to the vast majority of them. It was hard enough for women in the past to realize their far fewer expectations of marrying a good man and making a happy family. But feminism told a generation of women that they can not only expect to have that but, perhaps even more important to feminism, they could also expect to have a fulfilling, financially rewarding, society-honoring career. On a more fundamental level, the issue is what philosophy we subscribe to and does that philosophy reflect reality. I think the self-expectations one has of reality is important. False expectations can lead to disappointment. We live in a fallen world so even having true expectations can lead to disappointment. But better to think rightly about the world and deal with the issues as they come. Thinking wrongly may lead to more unhappiness for you because the world fails to be how you want it to be or it may lead to wrong behaviour which may create unhappiness for you or for others. This diagram from Global Warming Art helps show the contribution of various gases to heat retention in the atmosphere. On the spectral intensity graph the red line is the radiation coming from the sun. It is stylised by using a blackbox assumption feeding in the temperature at the surface of the sun. The red area is the radiation that is transmitted thru the atmosphere to the surface of the earth. The purple, blue and black lines are the radiation transmitted from the earth into space; again with a blackbox assumption based on temperature. The 3 lines represent 3 different temperatures from 210–310 K (–63 to +37 °C) due to the variation of the surface and atmospheric temperature over the earth. The blue area is what escapes into space. The next graph shows the absorption of the radiation (energy) at various wavelengths. Both for inward and outward radiation; these are predominantly non-overlapping. A level of 100% means that no radiation at that frequency gets transmitted thru the atmosphere (ie. from space to earth on the left side of the graph or from earth to space on the right side of the graph). A level of 0% means that all radiation is transmitted. Note that this is as a percentage of incident radiation, but as can be seen from the first graph, there is not the same amount of radiation for all frequencies. Thus high absorption near peaks of radiation is more important than high absorption at nadirs. Thus the resultant effect is seen in the first graph in the solid red and blue areas. The white area of the second graph is nearly a mirror image of the first graph (though stretched at low spectral intensities due to the first being an absolute scale and the second being a relative scale as mentioned). 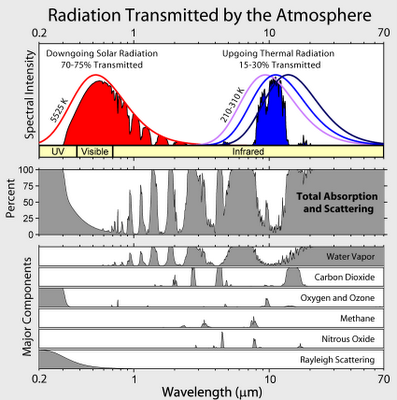 The bottom graph shows the spectral absorption of various gases and the effect of Rayleigh scattering. There is no scale on the y-axis but it is a percentage scale like the second graph. Note it goes from 0–100% for each of the 5 gases. Several things can be appreciated here. The most obvious being how important water is to heat absorption. Water reacts moderately to the incident solar radiation and significantly with the outgoing earth radiation. Any modelling of the climate that neglects to incorporate the effect of water, or treats it as an unchanging constant is virtually guaranteed to be incorrect. And this is just water vapour! The cloud effect is much more complicated. The interesting thing about CO2 is that several of the absorption lines correspond to wavelengths that are of minor consequence. They lie at the tails of the solar and earth spectral intensities. So the CO2 intensity band of most interest is the far right one. This band is important. It is wide and it is absorbs 100% of the incident radiation. It is also in an area where water absorbs a significant amount of radiation and given that there is far more water than CO2 in the atmosphere, the contribution from water at this frequency is not negligible. Anyone who has lived in a desert area where the relative humidity is frequently below 5%, knows that dry air is a lousy green house gas. It can be 115 degrees F (46 degrees C) during the day yet cool off so rapidly that a sweater is needed two or three hours after sunset. Despite the heat sink of the ground with rocks hot enough to fry an egg, the heat is radiated rapidly away through the dry air to the clear night sky. Since dry desert air has about the same .04% concentration of carbon dioxide as air everywhere else, it is not credible to conclude that carbon dioxide is causing global warming. Water vapor is the most effective greenhouse gas by far. With high humidity, even without cloud cover, the night air cools at a rate so slow as to be nearly imperceptible, particularly if you are trying to sleep without air conditioning. While not disproving global warming by itself, this statement reminds us how much more important water is to atmospheric temperature than carbon dioxide. The idea of using light emitting diodes (LEDs) for lighting is a technology that should already be used significantly in commercial and domestic settings. They are used in newer traffic lights which brings significant savings. Why not in housing? And using different coloured LEDs would mean that ambience could be set with shifts from warm white to cool white as well as a variety of colours. 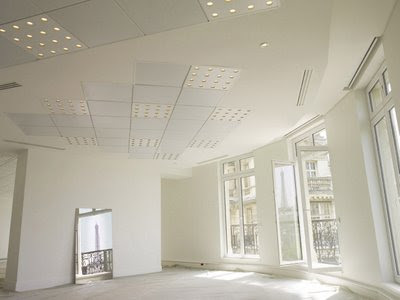 Philips have decided to light an entire office building with LEDs. the world market for LED Luminaires to grow rapidly by more than 30% per year driven by the entrance of LEDs in general lighting, from about EUR 700 mln last year to EUR 1.5 bn in 2010. Here's hoping for increased availability and decreasing costs over the coming years.